Attorneys Andres Alonso and David Krangle announce that Alonso Krangle LLP is ready to team up with referring attorneys who want to join their fight to protect the rights of victims in personal injury cases, defective drug and medical device litigation, construction site accidents, nursing home abuse, medical negligence, qui tam/whistleblower actions and consumer fraud cases. 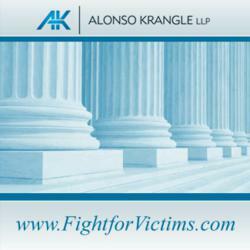 Alonso Krangle LLP - Teaming up with Law Firms across the Us to Fighting for victim rights. Inquire today! Personal injury cases, defective drug and medical device litigation, construction accidents, nursing home abuse, medical malpractice, whistleblower, and employee rights. The personal injury attorneys at Alonso Krangle LLP understand the value of teaming up with like-minded lawyers to help fight for victims rights. Attorneys Andres Alonso and David Krangle, founding partners of Alonso Krangle LLP, a national law firm focused on fighting for the rights of serious personal injury victims, are now accepting referrals from attorneys nationwide who wish to join the fight to protect the rights of injured victims. The personal injury attorneys at Alonso Krangle LLP understand the value of teaming up with like-minded lawyers to combat the well-funded defense bar. Attorneys who would like to "Fight For Victims" and discuss collaborations aimed at maximizing their clients’ recoveries are urged to contact Alonso Krangle LLP today. Alonso Krangle LLP is currently accepting referrals involving personal injury cases, defective drug and medical device litigation, clergy/sexual abuse, nursing home abuse, medical negligence, whistleblower/qui tam actions, employee rights, and consumer fraud cases. To discuss a potential referral with Alonso Krangle LLP, please contact us at 1-800-403-6191. Between them, Andres Alonso and David Krangle have spent more than 40 years successfully litigating mass tort and individual personal injury lawsuits. They are ready to put this experience to work in collaborations with referring attorneys throughout the country who seek to maximize recoveries for their personal injury clients. When referring attorneys choose to team up with Alonso Krangle LLP, they are guaranteed to receive the dedicated support needed to successfully guide their clients through complex litigations. Like Mr. Alonso, David Krangle has also been able to obtain excellent outcomes for his clients. At his previous firm, where was responsible for the qui tam/whistleblower litigation practice, Mr. Krangle represented a whistleblower in a major qui tam case in which Pfizer Inc. executives had been accused of wrongly promoting several of the company’s drugs. The case ended with record-breaking settlement of over $2 billion. [bloomberg.com/apps/news?pid=newsarchive&sid=a4yV1nYxCGoA] Mr. Krangle also acted as the liaison with referring attorneys at his previous firm, and assisted them in evaluating potential cases on behalf of their clients. As a result, Mr. Krangle understands the importance of maintaining excellent relationships with the referring law firms who place their trust in Alonso Krangle LLP. Second only to the relationship with the client is the relationship with law firms that honor Alonso Krangle LLP with their referrals. Mr. Alonso and Mr. Krangle are ready to share their experience and success with referring attorneys throughout the country who want to join their fight for victims’ rights. Referring attorneys seeking to maximize their clients’ recoveries are urged to contact Alonso Krangle LLP. Please call 1-800-403-6191. For more information about Alonso Krangle LLP or to join the fight and be a part of our team, please contact us at 1-800-403-6191.